Villa Gilani Cabinet. High end buffet. Designer buffet. Custom furniture. Villa Gilani Cabinet was inspired by furnishings of Mediterranean villas. This exquisite and unique cabinet has antiqued brass latticework as door panels. It has a Melamine-lined drawer and a shelf in each of its two compartments. Drawer pulls are hand-forged polished bronze. Four polished bronze glides are provided which also serve as levelers – a useful feature when the floor is uneven. 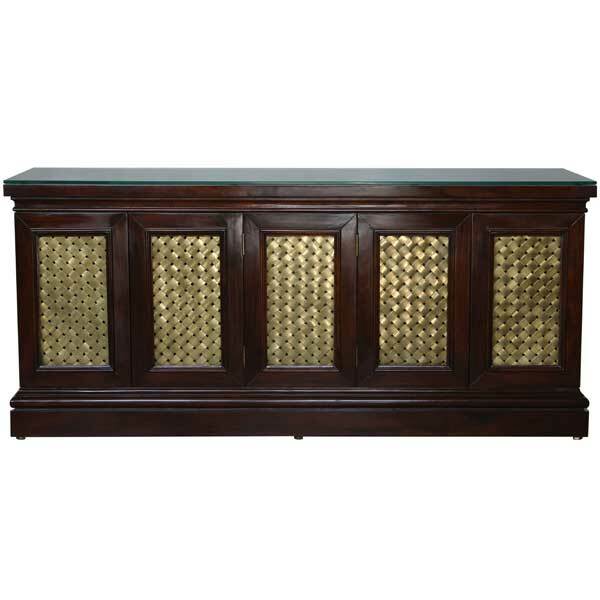 Constructed of selected rosewood and bonded wood, this unique cabinet is offered in a variety of finishes and accents. The Villa Gilani Cabinet was designed by award-winning designer Shah Gilani, ASFD, for use as a buffet in upscale residential and hospitality interiors. A glass top which fits this buffet perfectly is recommended. Custom sizing of this cabinet is available. One of the special services we offer is the ability to customize our standard product according to the client’s special requirements. Drawings are made and finish samples prepared for client approval before production begins. Delivery lead time is typically 12 weeks. We welcome international orders. We pack our product in export quality wood crates for safe and secure shipping at no extra charge. Our shipping department can arrange customs clearance and convenient delivery to the customer’s door anywhere in the world.